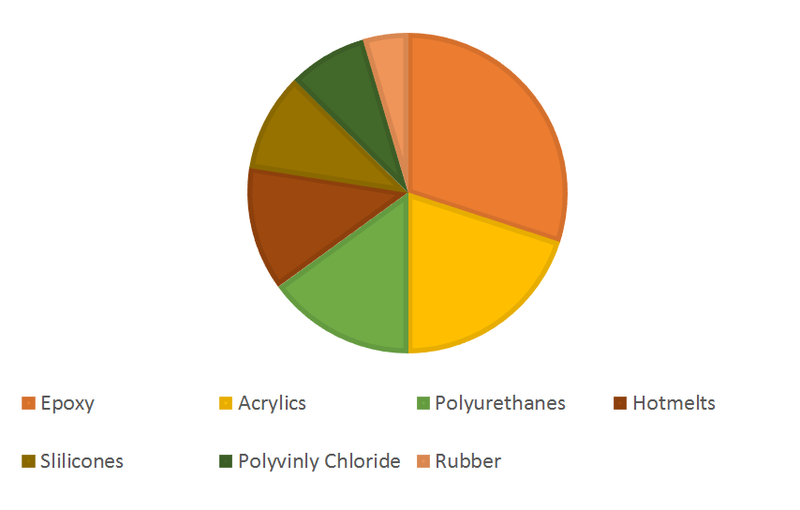 On the basis of type, global automotive adhesive and sealants market are segmented into epoxy, polyurethanes, acrylics, PVC, rubber, hot melts and silicones. Among all the segments, the global epoxy segment have been contributing largest revenue of USD 2.2 billion in 2017, registering a CAGR of 6.0% during 2014-2017. Based on application, global automotive adhesive and sealants market are segmented into UTH and power train, assembly, paint shop and BIW. Among all these applications, assembly was the largest application area in the market in terms of value. Increasing demand for high application offerings that works effectively in replacing automated fastenings and attaches rubber, plastic and aluminium products that are gaining traction in development of new cars, for instance Mercedes Benz that is rapidly driving the growth of automotive adhesive and sealants market across the globe. The automotive adhesive and sealants market is observing significant growth, owing to increased regulations for fuel by the government agencies, enhanced emphasis upon the utilization of insubstantial constituents and increased prominence upon safety norms and regulations. Moreover, contrasting to cast iron and steel constituents, lightweight materials do not have the capability to be bolted or welded to combine them with each other. Additionally, to develop and maintain the reliability of lightweight vehicles, the utilization of adhesive and sealants is rapidly increasing by the automotive manufacturers across the globe thereby bolstering the demand for automotive adhesive & sealant market across the globe. Increasing volatility in the oil prices and low awareness level regarding the advantages and usage of adhesives and sealants are expected to hinder the growth of automotive adhesive and sealants market in the near future. Moreover, development of stringent regulations and norms by government agencies for the usage of adhesives across several developed and developing economies is further hampering the growth of automotive adhesive & sealants market. Globally industry players are leveraging market growth by developing strategies to advance stiffness n vehicles, enhance crash robustness and decrease fatigue of the material, which is ultimately concentration upon the reduction of weight of the vehicle. The key players are concentrating upon enhancing the integrity and design of the vehicle along with meeting the increasing demand of electric vehicles of the consumers that is ultimately contributing towards the growth of global automotive adhesive and sealants market. Geographically, Asia Pacific accounted for largest revenue in the global automotive adhesive & sealants market in 2017 and is further expected to become largest revenue holder in this market by 2024. The increasing growth of this market is accounted towards extensive manufacturing capacity for passenger vehicles and LCV segment in this region that is projected to hold approximately 50% of the global manufacturing process. Additionally, accelerating demand for LCV and passenger cars in this region is exaggerating the demand for automotive adhesive and sealants in Asia-Pacific. Increasing disposable income, mounting economy and improved standards of living of the citizens in countries such as China and India, are the major factors attributed towards the increasing growth of automotive adhesive and sealants market. However, extensive production volume and stringent government regulations in the automotive sector in this region has majorly contributed towards the popularity of adhesive and sealants. Moreover, all these factors are strengthening the growth of automotive adhesive and sealants market in Asia-Pacific. Note: Financial insight and recent developments are subject to availability of information in secondary domain. Table 79 Snapshot - PPG Industries, Inc.
Table 81 Snapshot - Krayden, Inc.
Table 83 Snapshot - Dow Chemical Co.